You've found the “U.S. Iowa Blue Chicken Breeders” page here at Hobby Farm Wisdom! If this is the first time you have visited our site: Welcome! The Iowa Blue chicken breed originated in Decorah, Iowa in the early 20th century and despite its name, it is not actually blue. Their appearance is instead that of a silver white head and dark brown or black plumage with white lacing. They were once bred and sold in a number of hatcheries in Iowa but since they have closed, the breed has practically disappeared. Due to the fact that Iowa Blue chickens are extremely rare, they have never been recognized as an official breed by the American Poultry Association or any other breed standard. 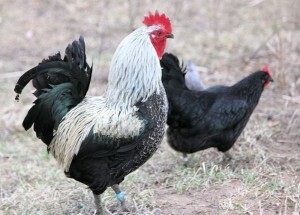 Iowa Blues are considered a dual purpose chicken, being moderate egg layers and producing a large amount of meat. While they are known for being slightly skittish, the males are excellent at protecting a flock.